You’ve probably heard of this classic cocktail, but have you ever tasted one? No? Well, you’re not alone. It’s a drink people rarely think to order these days. That’s a shame, because the Singapore Sling is a tall looker with an enticing flavor. Perfect for summer sippin’. The Singapore Sling originated in the Long Bar at the Raffles Hotel in Singapore (natch) sometime between 1905 and 1915. The whiz who created the drink was one of the establishment’s bartenders, Ngiam Tong Boon. It was an instant hit, and earned the hotel worldwide fame. Over time, however, the cocktail — and the Raffles Hotel — fell out of favor. The hotel even lost the recipe. A wide variety of recipes for the drink have sprung up since then, many claiming to be “authentic.” We may never know the precise ingredients and proportions of the original recipe. But cocktail sleuths and historians have done yeoman’s duty researching the composition of the drink. So today we have a good “standard” recipe. And what a drink that recipe produces! Once you taste it, the Singapore Sling just might become your favorite summer cooler. A sling — like a toddy — is a mix of spirits, sweetener, and water. Toddies are always served hot, but slings can be either hot or cold. And toddies are usually made with plain water, while slings typically use sparkling water like club soda, or even ginger ale. A gin sling, for instance, consists of simple syrup, lemon juice, and gin combined in a tall glass, and topped off with club soda. The Singapore Sling follows the same basic concept as the gin sling, but it’s a more complicated drink (some say it should really be called a tropical punch). People often think of it as a Tiki drink, and it certainly looks Tiki. It wears a little umbrella well and contains a couple of different fruit juices. Unlike most Tiki drinks, though, it contains no rum. Instead, the base spirit is gin. It also contains Cointreau, Bénédictine, and Cherry Heering. 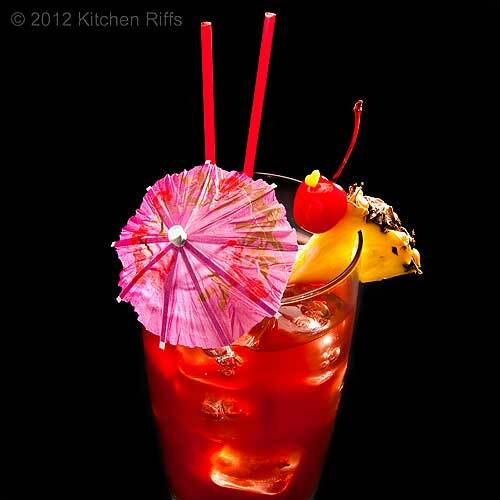 The Singapore Sling takes about 5 minutes to mix, and this recipe serves one. The source of my recipe is Ted Haigh’s Vintage Spirits and Forgotten Cocktails (a book I highly recommend if you’re interested in classic cocktails). Add all ingredients (except seltzer and garnish) to a cocktail shaker half-filled with ice. Shake well and strain into a tall (10 - 12 ounce) glass filled with ice cubes. Top with seltzer or club soda (about an ounce), add a straw and stir to mix. 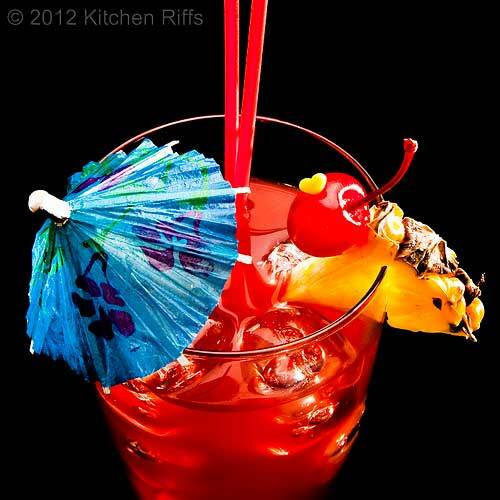 Garnish with pineapple wedge and/or maraschino cherry. There is no substitute for Cointreau in this drink, IMO. Grand Marnier doesn’t really work, and a less expensive triple sec just doesn’t deliver the proper flavor. You really do need Bénédictine to make a proper Singapore Sling — there’s no substitute for this sweetish liqueur. You can’t substitute B & B (a mixture of Bénédictine and brandy). The flavor is wrong (although B & B has a delightful taste of its own — drier than Bénédictine). 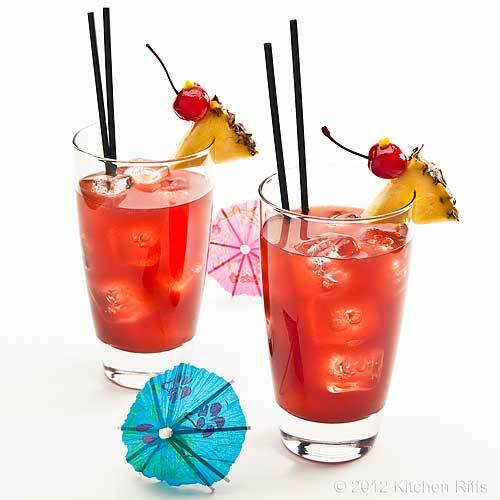 Modern Singapore Slings have a red hue because of the Cherry Heering and grenadine they contain. But some people claim that the original drink actually used a clear, dry cherry brandy (like kirschwasser). Made this way, the drink would have been light-colored, not reddish. One such recipe is suggested by David Wondrich. His Singapore Sling calls for an ounce of gin, an ounce of Bols cherry brandy (you can substitute Cherry Heering, but that will color the drink), an ounce of Bénédictine, and an ounce of lime juice. Shake, then pour into a tall glass and top with club soda. Ted Haigh says another sling cocktail was popular in Singapore around the same time as the Singapore Sling: the Straits Sling (the name is significant because locals called Singapore the “Straits”). Check out our post on The Straits Sling for instructions on how to make it. Could the Straits Sling actually have been the original Singapore Sling? Who knows? 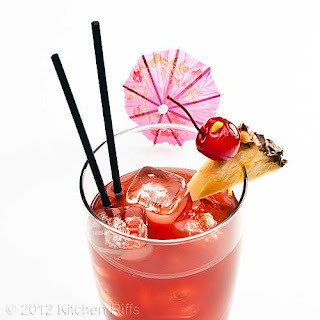 Although Wondrich’s Singapore Sling and the Straits Sling are pretty good drinks, I think the tastiest of all is a Singapore Sling made with pineapple juice and grenadine — the recipe I provide above. It’s also much prettier. My recipe does have a downside. It requires two ingredients that you may not find many other uses for: Bénédictine and Cherry Heering (although Bénédictine is a nice after-dinner drink, particularly mixed with brandy – you can make your own B & B). The upside? This drink is so good, you’ll want to make it often! And Labor Day is coming up soon. If you serve Singapore Slings to the crowd at your annual Labor Day cookout, you’ll put a pretty good dent in those bottles of Bénédictine and Cherry Heering. What’s that? You say you don’t usually have a Labor Day cookout? Well, shouldn’t you go for it this year? It’s one last chance to fire up the grill, and it’s a great excuse to drink something summery — like a Singapore Sling. Your family and friends will be toasting your mixological brilliance. You party animal, you. Henry & I are so with you on that one! When's the next open weekend? No, I haven't tried this cocktail yet, I've heard of it though. This post makes me thirsty for it! I've heard of the Singapore Sling but haven't ever had one. Crazy, right? How could this be? Looks sooo good too, especially with the pineapple juice. Thanks for the recipe! We won't even discuss how many Singapore Slings I've experienced during my hey day of partying time:) Now, to say I actually knew whatever ingredients went into those "babies", not a clue. Glad to finally learn them and of course I luv the sips of history too. I could just see the face of a bartender if I ordered a Singapore Sling here in Maine. Now, I can just smlle and say that I have a friend who makes them great. LOL. I've given up ordering a cocktail out...I just order a glass of wine. There are a lot of ingredients in this drink but as soon as I saw the pineapple juice and cointreau I was won over. I wonder if Hemmingway tried this drink. This is gorgeous. I just love your drinks. I live vicariously through your blog. Hi Beet, look in the dictionary under "party animal" and there you'll find your picture, along with Henry's. ;-) Thanks for the comment. Hi Marina, well, in most of the US it is. ;-) When we lived in Florida we also curtailed our summer grilling somewhat because of the heat. This is a good cocktail - worth trying. Maybe you can do it on Labor Day - the kickoff to your grilling season! ;-) Thanks for the comment. Hi Kristy, I'll bet most people haven't had one of these. But it's really good, and the pineapple juice in it is really refreshing. Thanks for the comment. Hi Louise, glad to hear you've experienced this before! And I love your "sips of history" comment. ;-) Speaking of comments, thanks for your! Hi Karen, I hear you - when one thinks Singapore Sling, the first thought to pop into one's head isn't the state of Maine! Frankly, we rarely order cocktails out unless we're at a place where we know they do them well - too many restaurants just don't pay enough attention to cocktail. What you get often isn't that good - easier to make them at home. Thanks for your comment. Hi Choc Chip Uru, I'd say this would be a colorful one for you to try in a year. It's might tasty, too. Thanks for your comment. Hi Suzanne, although I have no knowledge that Hemingway actually did try this one, I just assume he did - he seemed to try everything! At least once. ;-) Thanks for your comment. Hi Kim, happy to provide you with some pleasure! And it is a quite pretty drink. Best of all, it's extremely tasty. Thanks for your comment. I know I had one of these a long time ago but can't remember what it tastes like. You always make me want to try things because of your great stories. And I actually have Benedictine and never knew what to do with it. We bought it from a liquor store going out of business. P.S. I like the little heart! Hi Abbe, now you have a use for your Bénédictine! But really, try mixing it about 50/50 with some cognac or brandy - it's a pretty good after dinner drink. Thanks for your comment. Aren't those great?! I forget where we found those little cocktail picks - it may have been the grocery store - but their shape certainly adds interest to the pictures. Hmmm John you are making me thirsty. The name Singapore Sling rings a bell, I just don't know where I had it. I'm pretty sure though that I love this cocktail.. anything sweet, yes that's my drink. Thank you so much for the blog love. And I'm so happy to have a "neighbor" here in STL who blogs like me! Say hi to Mrs. Kitchen Riff for me. Hi Malou, you need to try one just to refresh your memory! I'll definitely say hi to Mrs K R. Thanks for taking time to comment. I'm definitely old enough to have had a Singapore Sling. It's been ages though and I think an update is in order. Again, gorgeous photo! I love Singapore Sling's they are a great drink, I love the colour and the taste of pineapple is my favourite part, great photos. Yay! I've been waiting for you to do a Singapore Sling recipe. My mother in law loves these. I'll have to surprise her with one now I have your recipe as a guide! Hi Maureen, I'm old enough too, but oddly I never had one until this year,when I started to research the drink for this post. Because it was research, of course, I had to be through. ;-) And you definitely need one again. Thanks for the kind words, and the comment. Hi Alessandra, I agree - it's a wonderful drink. So refreshing and with great flavor. Thanks for the kind words, and the comment. Hi Amanda, I'm happy that I was able to help you out! She'll be delighted with your surprise; heck, you both will be since it's an excellent drink! Thanks for your comment. Hi Jen, it is, it is! Particularly if you have too many. ;-) Thanks for your comment. I had no idea that this drink originate more than 100 years ago! Interesting! I've had a few of them and love, but love them too much. One of those drinks that goes down too easy! :) It's good to see what it's made of. Always wondered where the cherry flavor came from. Hi MJ, an awful lot of drinks were created in that time period through the end of prohibition. I'm not sure if I'd call it the golden age of cocktails, although the cocktail as we know it today was created then. And I agree that too many of these is dangerous! Thanks for your comment. Looks very interesting and I might just have to give it a try. However, I just can't read the name of this drink without thinking of Tom Cruise in Cocktail. "The Singapore Sling, the Ding-a-ling"
Hi Tralliam, I've actually never seen that movie! You should definitely give this a try. It's a bit on the sweet side but has great depth of flavor. Thanks for your comment. This sounds like an exotic drink. I would love to try it. Hi Asmita, it's really a wonderful drink. Hope you have an opportunity to try it! Thanks for the comment. I have a friend who always talks about these cocktails. He keeps promising to make me. But maybe I'll surprise him instead with your recipe. Thanks for sharing. Hi Spicie Foodie, that would be a nice surprise! I hope you enjoy the flavor of the drink - I'll bet you will. Thanks for the comment. Makes me want to sit out and relax on my deck and sip on one or three of these! This drink sounds like something that I would like. Hi Jess, this is a super deck drink. And a couple is an excellent number. Three? Just don't drive. ;-) Thanks for your comment. Hi Words of Deliciousness, the only way to find out is to make one and take a big sip! It's really a good drink - well worth trying. Thanks for commenting. I have never made a Singapore Sling. How can that be? It's so pretty. I do reach for rum more often than gin, but I definitely need to give this a try. Hi Lisa, you're going to have to make one of these to rectify that! Actually, I never made one before this year either. I like gin a lot, but you can do so much with rum. Thanks for your comment. Goooooodness!!!! This looks sooo delicious. I wish I could make it today but I don't have a few of the ingredients. Definitely saving it though. Will be back to tell you how wonderful it was! Hi Bam, how was your trip to Michigan? I'll have to check out your blog to find out. ;-) Thanks for your comment. Hi Tia, this is one of those drinks that for most of us requires some shopping. It's worth it though - I think with your love of cocktails that you'll enjoy this. ;-) Thanks for the comment. Hi Nami, I got interested in cocktail in part because of all the interesting stories surrounding some of them. Literally for years I just read about them, until I started tasting them (I was a wine drinker back then). Some of them have such amazing flavor that once you've tasted them, there's no going back. Thanks for the kind words - I like that 2nd shot a lot too, in some ways more than the top shot. And also, thanks for your comment. I do a cocktail post every Friday and have yet to put this one on there; it seems a bit too late this season but right now I would LOVE one. In the summer I love them all fruiting and slushy and a bit boozy. This fits perfectly! Hi Barbara, the weather has been so warm that you might be able to squeeze this in, but otherwise you have the pleasure of looking forward to it next year! Thanks for your comment. Is there anyway I can see when you reply to a comment Kitchen. The only reason why I saw this one was because I just popped in on your Healthy Bean Salad. Do others have the same problem I wonder? Whoops I think I just figured it out! Hi Louise, you can subscribe to comments - linky deal in the column to the right. Hi Louise, ;-) Glad you found the subscription button (for anyone mystified by this comment, just scroll up to Louise's previous comment). Hi Jenny, this is really a nice drink! Well worth trying sometime. BTW, one of the best drinks with Cointreau (that I know, at least) is the Sidecar: equal parts of cognac, Cointreau, and fresh lemon juice. Some people like to make it 2 parts cognac, 1 part each of the other two - it's fun to experiment. Thanks for the comment. I'm glad I figured it out too! Thanks!!! I'm thinking about putting a FAQ together - this would be a good thing to add! It just might be. I felt silly when I found it. I mean really it's so obvious however...I missed it. Perhaps others are also.